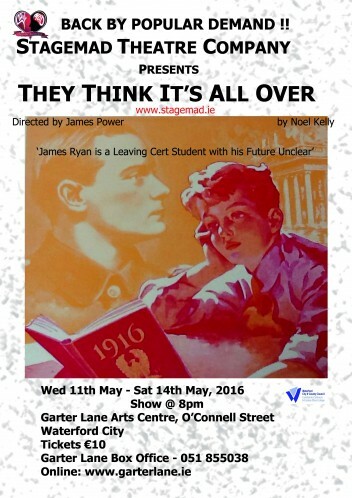 Garter Lane Arts Centre Thurs May 12th to Sat May 14 at 8pm. A Noel Kelly play starring Jamie Flynn set in Waterford in the Spring and Summer of 1966 as Ireland celebrates the 50th Anniversary of the 1916 Rising and Waterford FC win their first League of Ireland championship. James Ryan is a Leaving Cert. student with his future unclear. Chosen to play the role of Patrick Pearse in Bro. Dorgan’s school Pageant, he is also a schoolboy Soccer star with ambitions to play for Manchester Utd. But when the newly-formed school Soccer team wins the local ‘Easter Cup’ competition, it faces a rather different opposition to get to the National finals. And now James is faced with a dilemma. So what should he do? Stay loyal to the Proclamation and face possible defeat, or make a solo-run and maybe change the world! The play explores ideas of identity, family, remembrance, loyalty and nationalism. As the GPO beckons and the 1966 World Cup Finals are about to kick off in Wembley, James Ryan has more than the Proclamation on his mind. Starring Jamie Flynn. Date: Thurs May 12th to Sat May 14 at 8pm. This entry was posted on April 26, 2016 by waterfordarts in theatre and tagged garter lane, Garter Lane Arts Centre, Jamie Flynn, Noel Kelly, Stagemad Theatre Company, theatre at garter lane.